1. Meeting new friends at the Rugby Reception. Everybody was so incredibly nice and they made a point to come up to me at the match on Saturday and say hello! I love making new friends! One of last year's football players' mother past away a couple of weeks ago from breast cancer. From what I understand, it was the boys' idea to wear pink, and, if I'm not mistaken, they will be wearing them again for the next game. What a great group of boys! 4. Another nice surprise: Thursday OS called to let us know that he's coming home this weekend! All boys under the same roof for 1 night! 5. Some major catching up on sleep. And with the cooler weather, there's been some really good sleeping temps this week! If you haven't, be very, very careful. It is addictive. Dry roasted peanuts mixed with candy corn. The mixture of salty & crunchy with sweet & soft. It tastes a lot like a Payday candy bar without the chewiness of the caramel. We know it's time for her to get groomed when she gets "velcro toes". That's when her toenails get stuck/caught on the rugs. I had never heard of that breed before, but she looked like a cross between a schnauzer and a pug. Very cute! 8. (This is the last one...promise!) The best thing about being on Fall Break is getting a break from a schedule. Sometimes it's nice to just be able to catch up on blog reading, being able to clean up the blog a little, and relax by watching movies. Movies watched this week: Dear John (It's based on a Nicholas Sparks' novel so you know it's gotta be good! ), Bounty Hunter ( a little disappointing, but looking at Gerard Butler is never disappointing! I missed his accent, though! ), and Killers (I thought it was very good.). Since it's fall and football season, this weekend will be filled with...what else but...football! YS' band has a competition on Saturday, but it's local. If I'm really lucky, I'll be able to go, get in free (one of the county high schools is hosting the competition), watch the band perform, then get home in time to see most of the UT/Ga. game! Those are all wonderful faves. I got my hair done today and Skye goes tomorrow. I have to remember to pick up some candy corn. I'm so glad I saw your Blog today. Love.Love.Love. 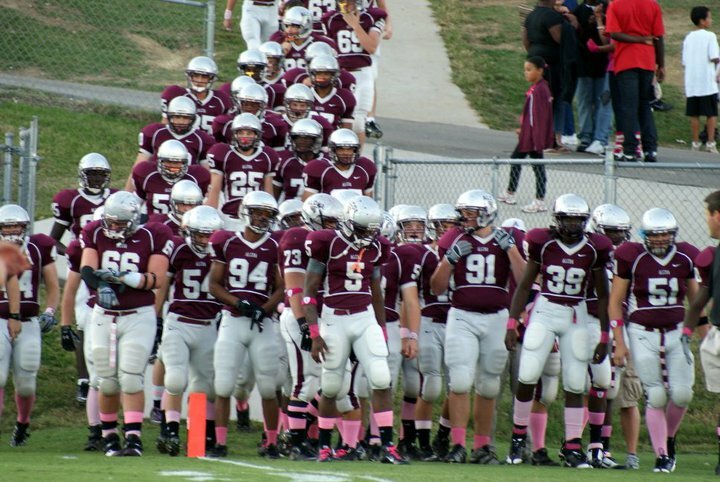 the story about the football team wearing pink. What a GREAT bunch of boys. I'm thinking you should send this story on to CNN or one of the other major news stations. I think lots of people would be touched by their actions. So happy for you to have your boys home and all together! Breaks...no schedule...got to love it! We have had the BEST vacay yet. Glad you have enjoyed yours! Love the guys in pink. My gosh they look so big!!! And GO VOLS!!!! Enjoy having everyone home all together...even one night is worth celebrating! Oh and I love the pink story! Go Vols! They are in a transition year but we like the coach and they seem to have heart. Great things to be thankful for. Enjoy your weekend with all your boys!!! Oh my goodness... what amazing young men!!!! That is awesome to see! 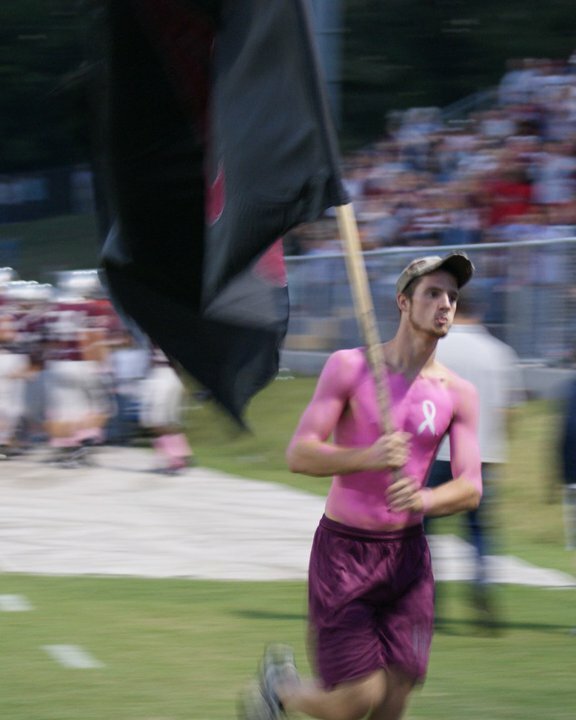 Love the guy who even painted his body pink!!! I sat & ate Roasted peanuts with Candy corn till I was sick last weekend... mmmmm... so good! Fall break sounds like a great idea. Yours, sounded wonderful. I'm glad you had that time to refresh. Our dog is a schnauzer-shitzu mix, but she looks mostly like a Lhasa Apsa. Hope you have a wonderful weekend. enjoy having the boys home. I love dogs...If I had seen that dog I would have been tempted to bring him home. You are for Tn I assume. Hubby often gets told he has a Tn accent. Glad you had a great fall break. 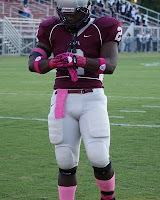 It is great that the football players did that, I just wish other forms of cancer could get as much awareness. WTG to the football team. That is so cool! Enjoyed your list of FAVES. I will have to try the peanuts and candy corn, I love paydays! Hope you have a wonderful weekend with your boys at home! Yes, pansies do need quite a bit of sun to bloom and keep that vibrant color. They last for such a long time and are such happy plants. I love them! No fall break here yet, lol! Sounds like you are enjoying yours though - fabulous!!! I just did the candy corn and peanut thing last week. My husband is now addicted! Love the idea of the team wearing pink socks! Very heartwarming. love that those football players are wearing pink. I have no doubt you did something right raising your boys and I now have the urge to make the addictive candy corn snack! Love the pink socks! Boone had Pink Out! night last night. Since we went to Cades Cove, I haven't heard how it went, but I saw lots of pink at school...both teachers and students. I love it when both my boys are home at the same time...just happens too few and far between for my happiness! What an incredibly sweet thing to do...those football players!!!!! Wow!! !